Monroe County is located on ancient lake bed. The flat land is the product of a time when Lake Erie had aspirations of grandeur. Flush with the melt waters of the great glaciers, the lake once lapped against the moraine hills around Ann Arbor (before the University was there, of course). Eastern Cottonwoods are the dominant tree here because they thrive in the moist clayey soils deposited during that time. They can attain great height and size and are, in a contorted and sad way, our version of the Redwoods. They lord over the landscape where you don’t have to get very high to lord over (it). 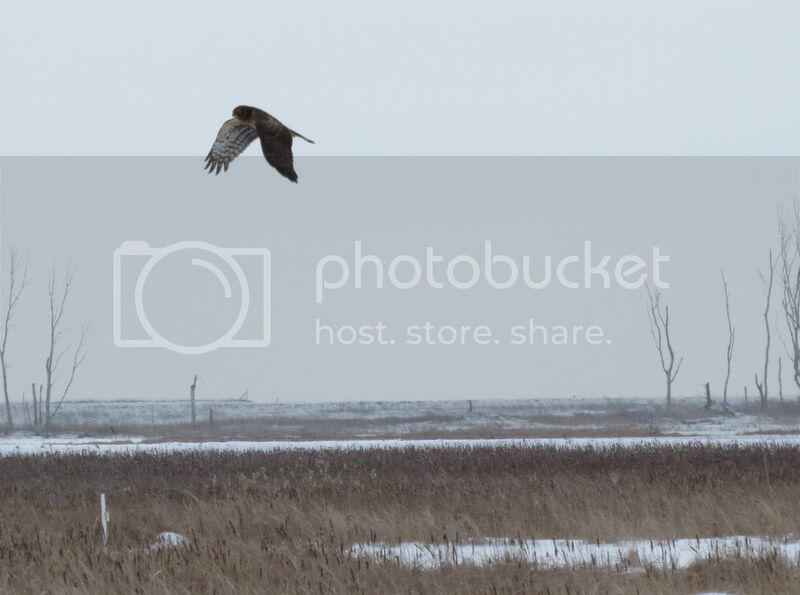 It is natural, therefore, that local birds of prey gravitate to Eastern Cottonwoods as their observation posts of choice. It is fitting, although bordering on sarcastic, to say that if you seek b. o. p.’s then look in the high branches of the E. C. T.s. I offer three examples – actually two and a half – as my exhibits in today’s blog. Throughout S.E. 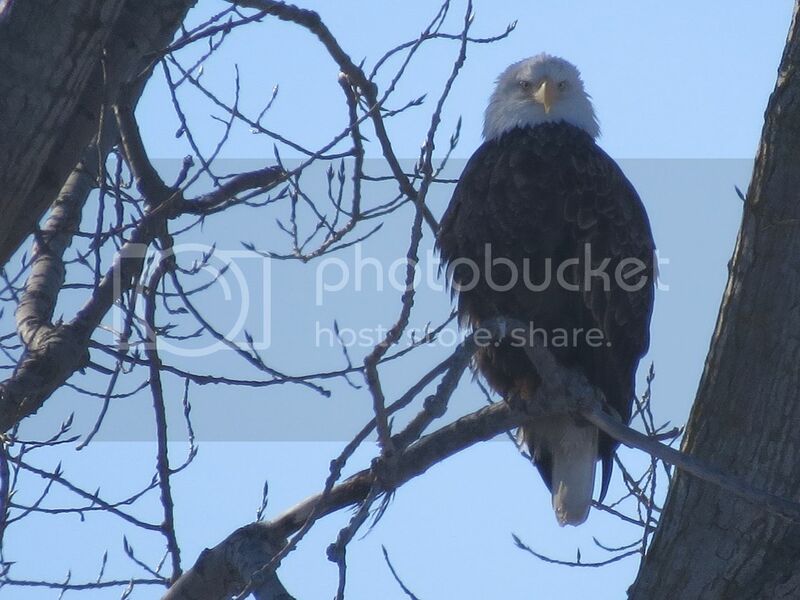 Michigan, and especially along the Detroit River and Western Lake Erie, Cottonwoods and Bald Eagles go together like bad taste and reality television. They build their massive nests in them, roost in them, and generally perform their daily work among them. 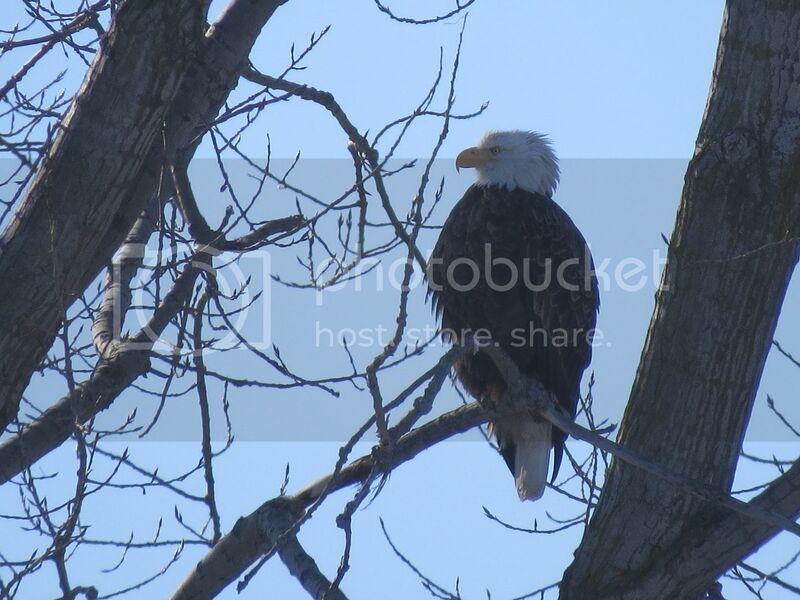 I spotted one of the resident Bald Eagles eying the River Raisin on a recent bitter January morning. Perched high in the branches of a large Cottonwood on the opposite bank, the mature Bald Eagle technically wasn’t “working” at the time I observed it. It was looking around but not down – which goes a long way towards explaining why the hundreds of Canada Geese and Mallards cavorting in the icy water were unconcerned. Fish are the major item on the eagle’s menu, but waterfowl are often a preferred side dish so it is wise for them to pay attention to the moods of a nearby predator. This eagle was chilling – In more ways than one – and therefore not a threat. 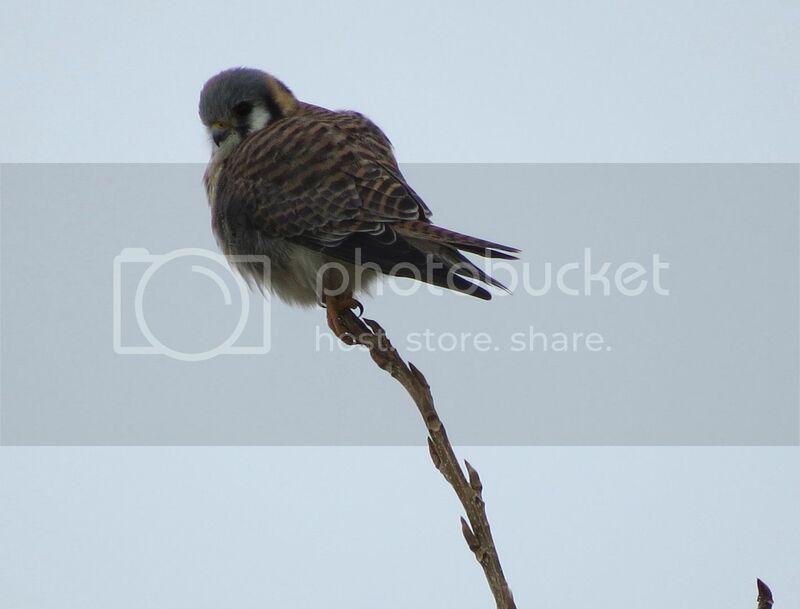 Further east, and a week later, a male Kestrel chose the highest possible end of the highest possible branch on a medium sized Cottonwood at Sterling State Park along Lake Erie. 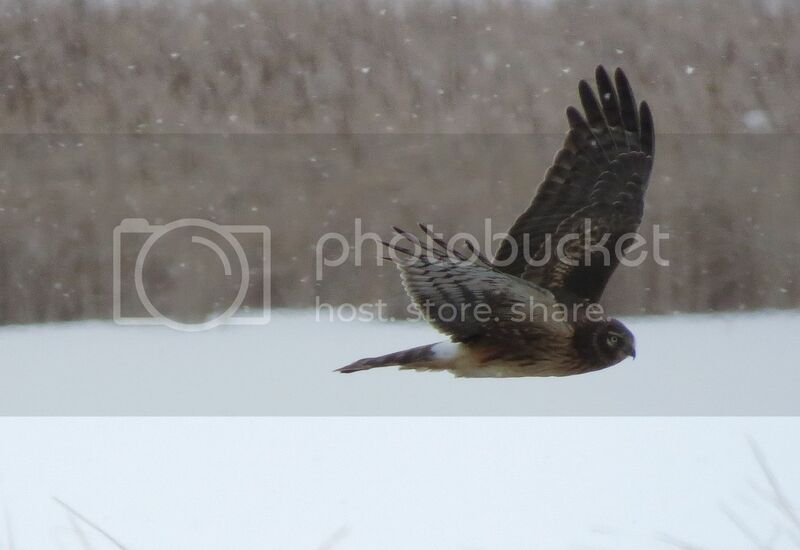 Proportionally, however, this bird of prey was about the same size to its Cottonwood as the Eagle was to its tree. 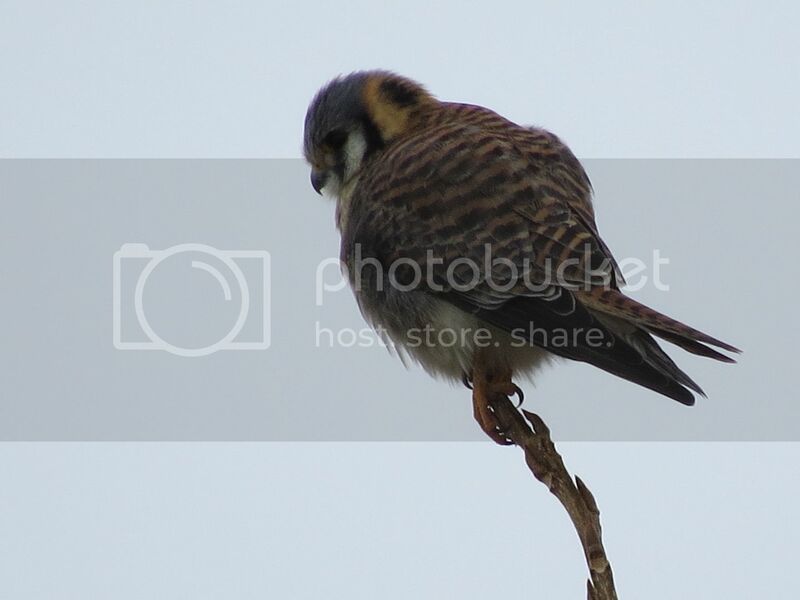 The tiny raptor was using his cottony perch to scan the grassland below for Meadow Voles. Occasionally it shifted its head from side to side in order to get a perspective view of a potential target and then nervously pumped its tail upon discovering that the movement was generated by a wind driven leaf. 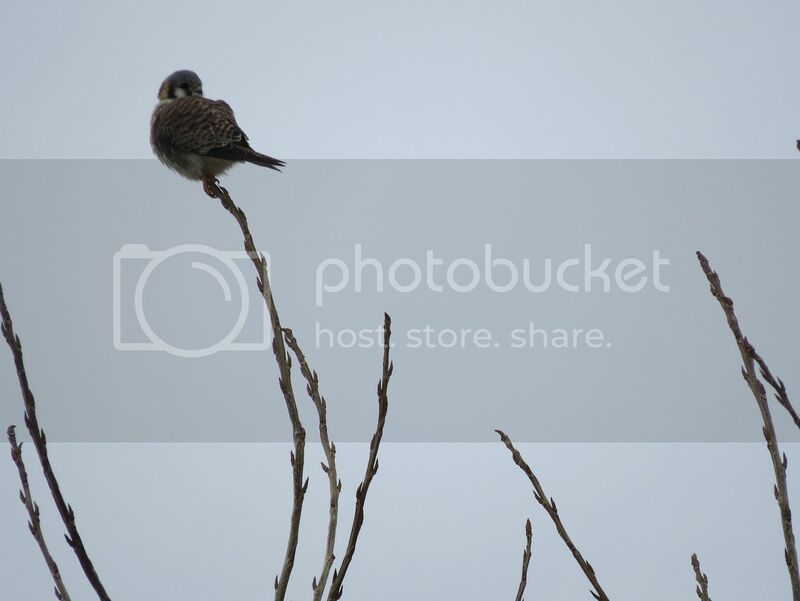 The bright colors of the American Kestrel are muted in the dull light of mid-winter. Feathers fluffed out as protection against the cold further diffuse this colorful attire. Even so, this bird could not hide its varying hues of orange, rust, and slatey blue. Black “eye spots” on the back of the head were especially visible on this hunter. The Kestrel did not make a kill during the time I watched it and cast quite a few “act like a tree and leave” glances in my direction before I got the message. My final offering comes in the form of a pellet as opposed to an actual predator in a Populus tree. 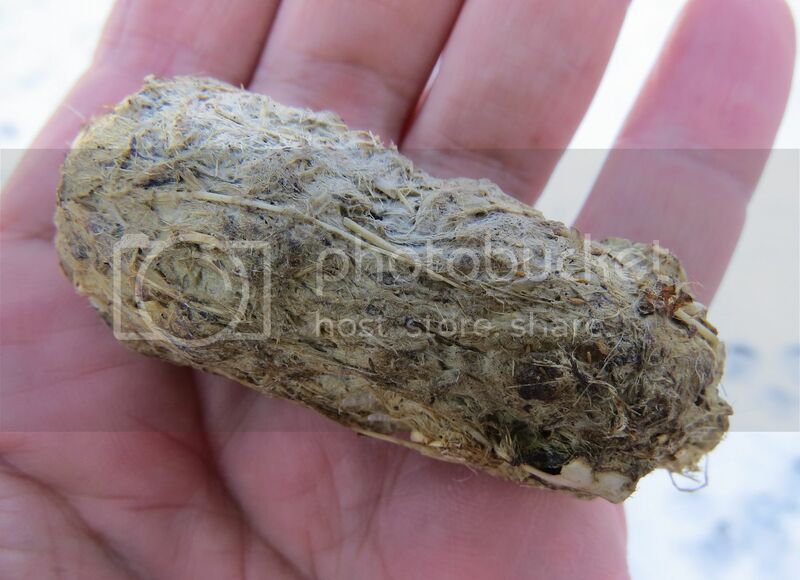 Found on the ground beneath the cover of a vine tangle, this large pellet (about 3 in. long) consisted entirely of Ring-billed Gull feathers and bones. I can state the feather identity with certainty because of the single Ring-billed Gull wing that laid atop the vine cluster overhead (see above). Scattered down feathers and whitewash lay about the place. The branches of a huge Cottonwood towered over it all, of course. There is little doubt that a large bird of prey sat upon its branches while discombobulating the unfortunate gull – dropping pellet, parts, and poo in the process. I cannot say for certain who the pellet perpetrator was in this case but will give it a hoot. 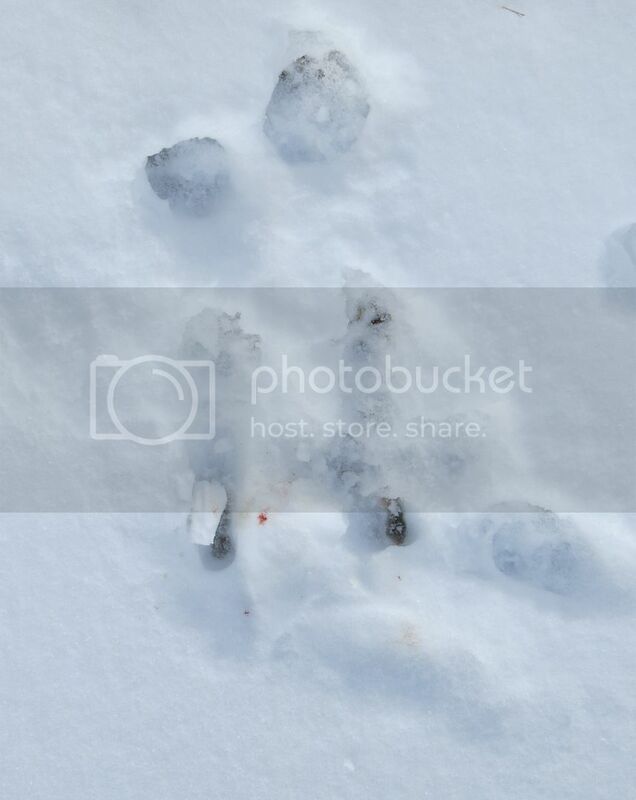 Owls and raptors (daytime birds of prey) both cast pellets. I am guessing it to be from a Great-horned Owl due to the tremendous size and relatively good condition of remaining quills within. 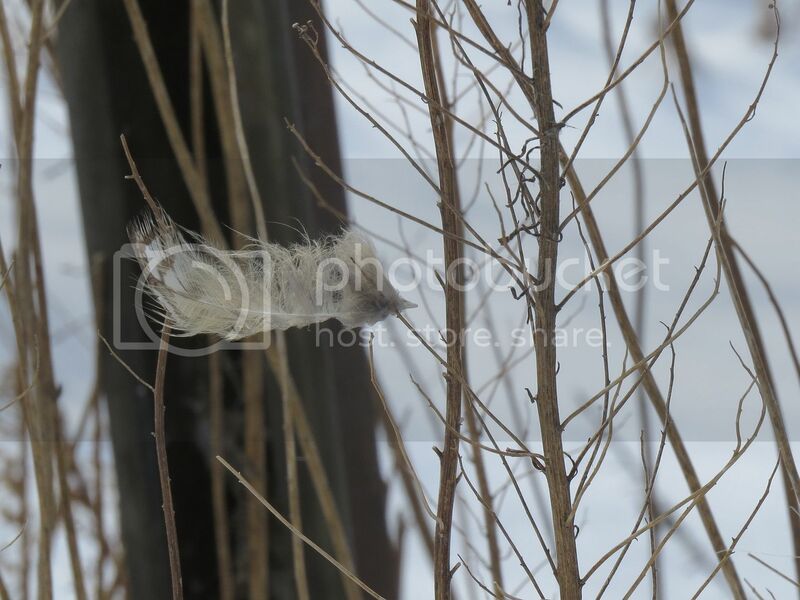 Snowy Owls also produce such pellets but rarely chuck them in a wooded setting. 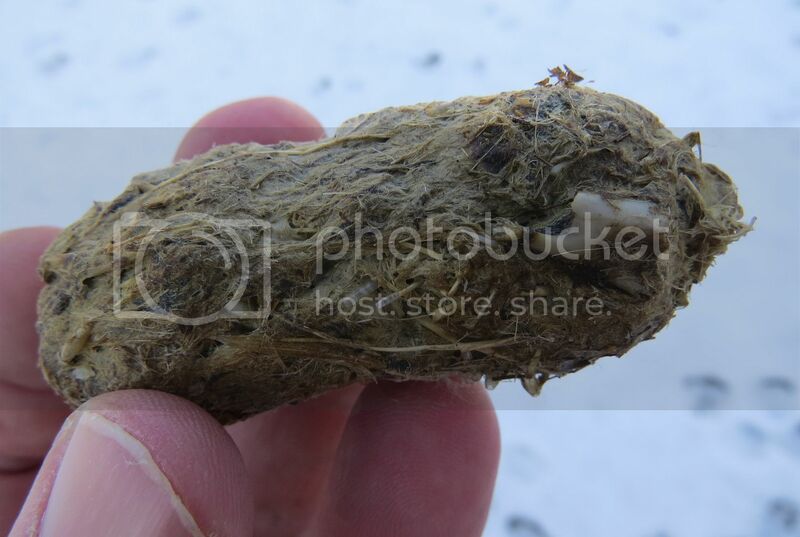 A Peregrine Falcon would be a likely raptor candidate – especially given their bird-oriented tastes – but from what I can decipher their pellets are much smaller and more amorphous (due to stronger stomach acids). So there you have it. Cottonwoods and carnivorous fowl have a somewhat commensal* relationship in this neck of the woods (or foot of the water, as it were). These birds of prey were definitely barking up the right tree – even if it was really the only tree! 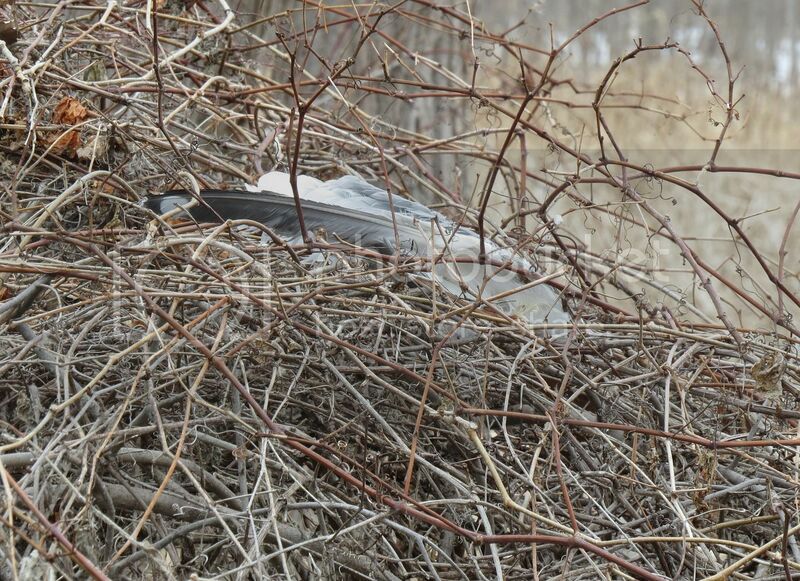 *Definition time: Commensalism means a relationship in which one organism benefits while the other is relatively unaffected (in other words the Cottonwoods do not derive any benefit from the birds whereas the birds gain useful observation posts). A walk out on the dikes at the Pointe Mouillee State Game area in the middle of winter can be a bit like walking the Arctic Tundra. It’s little wonder that wintering Snowy Owls choose this place because it feels like home. Only broken cattail skeletons and clumped grasses serve as cover and because the dikes rise well above these there is no cover at all for the winter walker. An infant breeze entering at lake grows into ferocious adulthood as it traverses the open expanse. In other words, it can be bitter cold even on “mild” days. 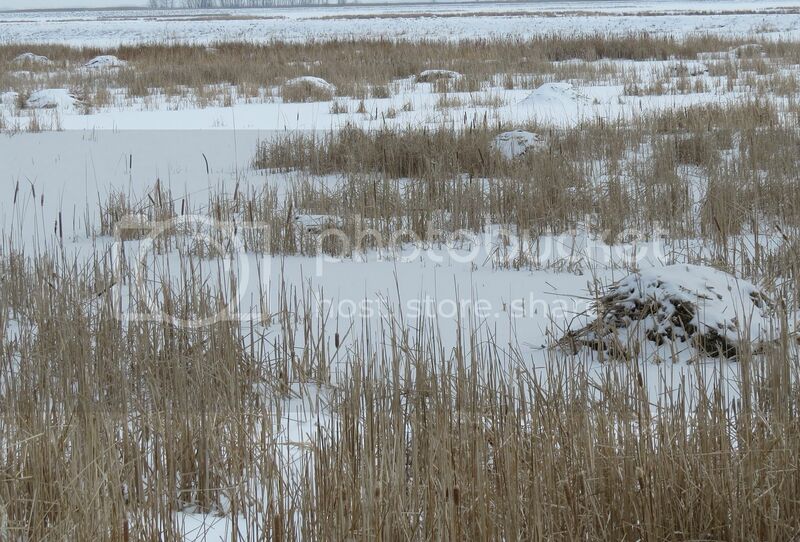 The winter version of the marsh is not devoid of life, however, it’s just that you have work harder to find it. My last foray out onto the dikes was on a mid-20 degree day (that’s F, by the way – I don’t speak C). There was little wind, so the dreaded “Mouillee chill” was minimal. 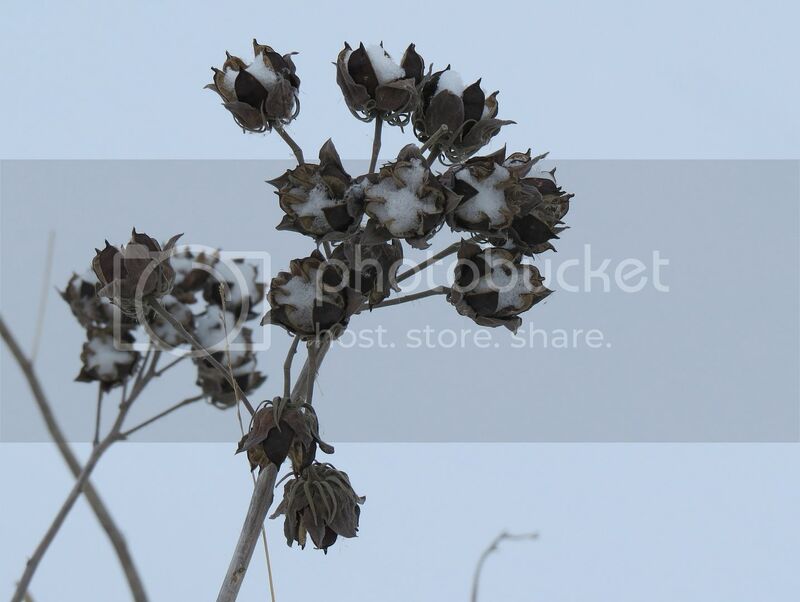 A light snow refreshed the place and turned every Rose Mallow pod into an open cotton boll and highlighted the dome of every muskrat lodge in the ‘rat-pocked landscape. There was plenty of evidence that creatures were about on the previous evening. 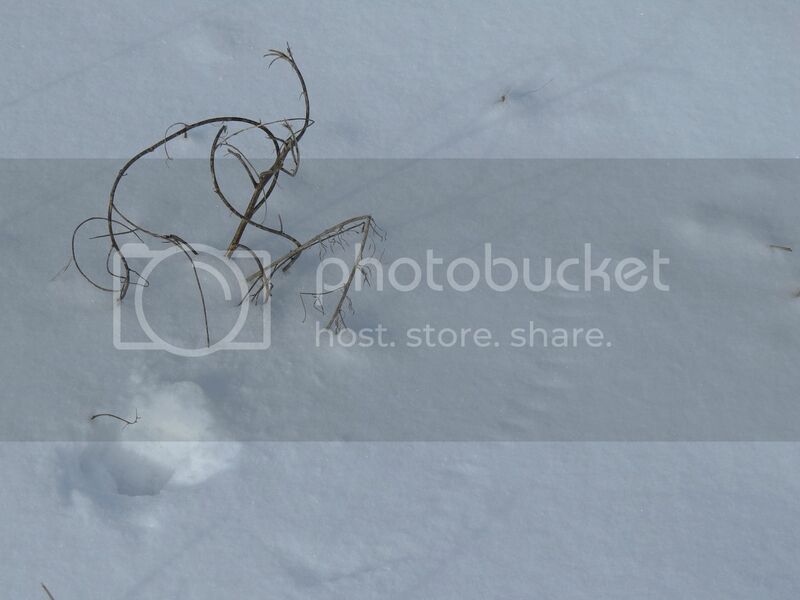 Countless Meadow Voles were taking advantage of the snow cover to forage on grasses under the snow. Their tunnels, evidenced by their fractured roofs and occasional exit holes, laced the dikes (see above). Frustrated by such protective cover, predators can only hope to catch the slight movement of the snow in order to pinpoint the prey below. Brushed wing tips and talon marks indicate where one aerial predator attempted a halfhearted grab at an invisible morsel. White-footed Mice made frequent dashes across the open path during the night as well. 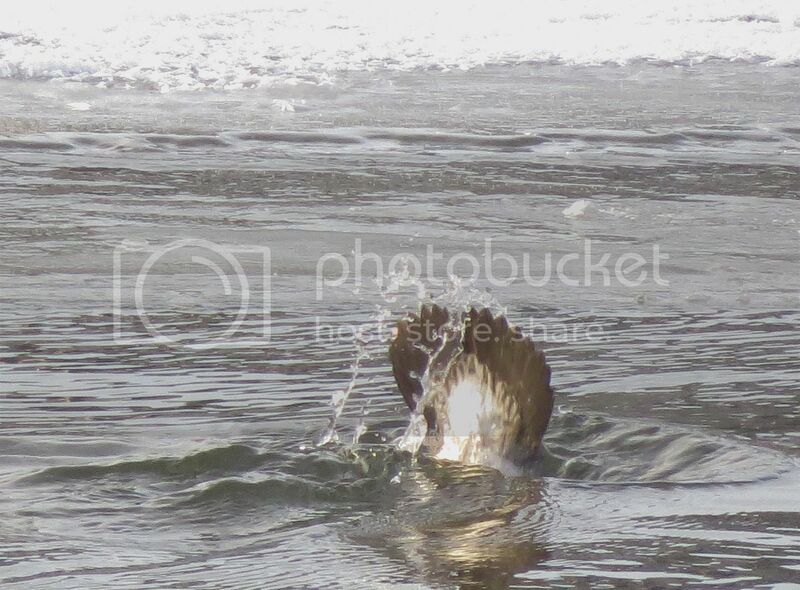 Most executed a straight shot – slapping long tail marks from side to side as they went. The track of one individual, however, reveals a halted crossing, followed by a nervous retreat and then a renewed all-out dash (below). Perhaps it caught a glimpse of shadow from above or a movement from aside. You can never be too careful when you are a menu item. Coyotes evidently patrol every inch of the place on their nightly rounds. 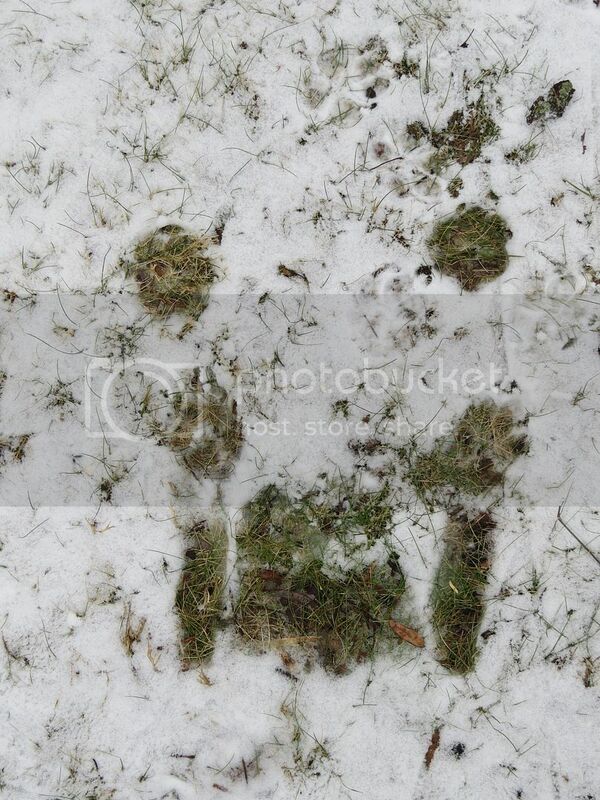 Sitting down to contemplate the view, one of the canines left a familiar mark in the snow. 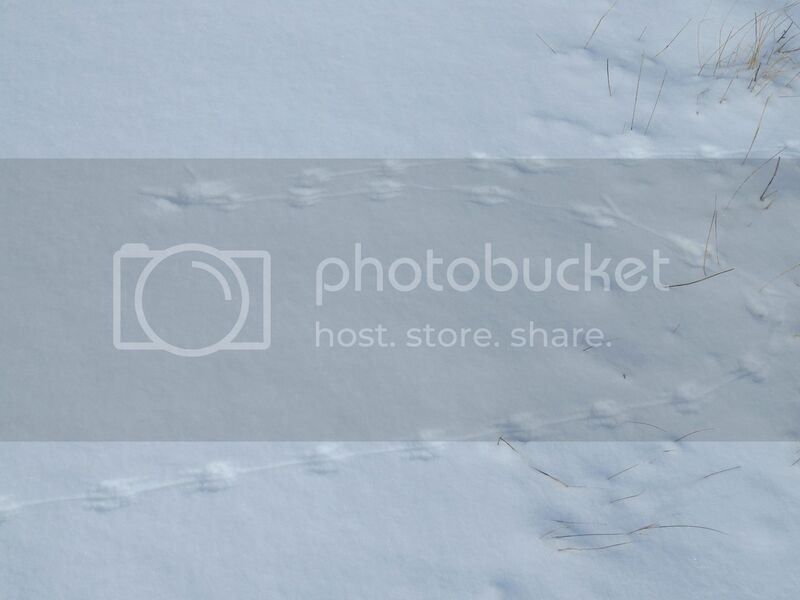 Clear heel and hind foot prints and shifting front paw marks indicate that it might have paused to lick a small cut – as suggested by a spot of blood in the snow near the haunches. Last week my daughter’s Black Lab left a near identical mark (sans blood, of course) where it sat for several minutes to survey the back yard. Like two exclamation marks they mark the behavior of both wild and domestic dogs. 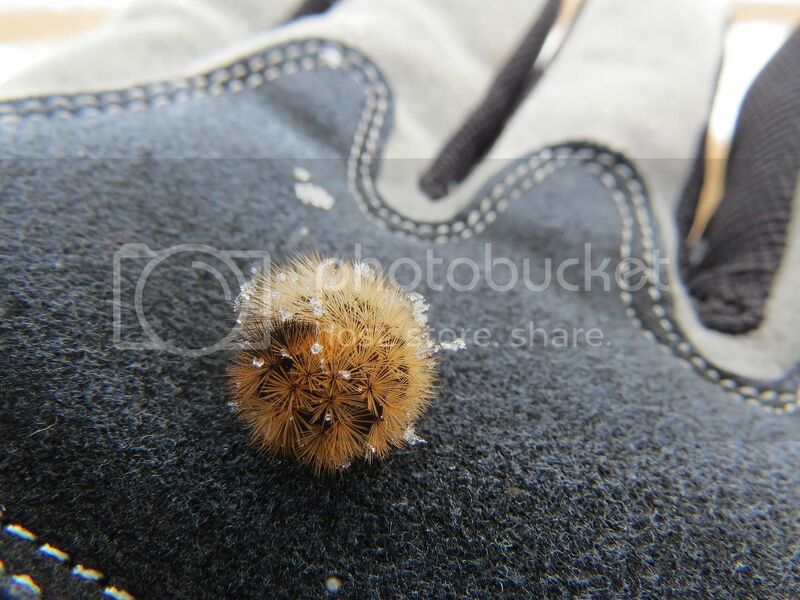 Perhaps the most surprising finds were several Tiger Moth caterpillars walking across the snow. I’ll remind you that even though the sun was peeking out from time to time, it was in the twenties. These hardy insects were slowly making their way across the surface. Due to their lightness they left no tracks and due to their speechlessness did not offer an explanation for their seemingly risky behavior. I believe they were Ruby Tiger Moth larvae – a worldwide species which feeds on a wide variety of plants such as goldenrod, ironweed and plantain. 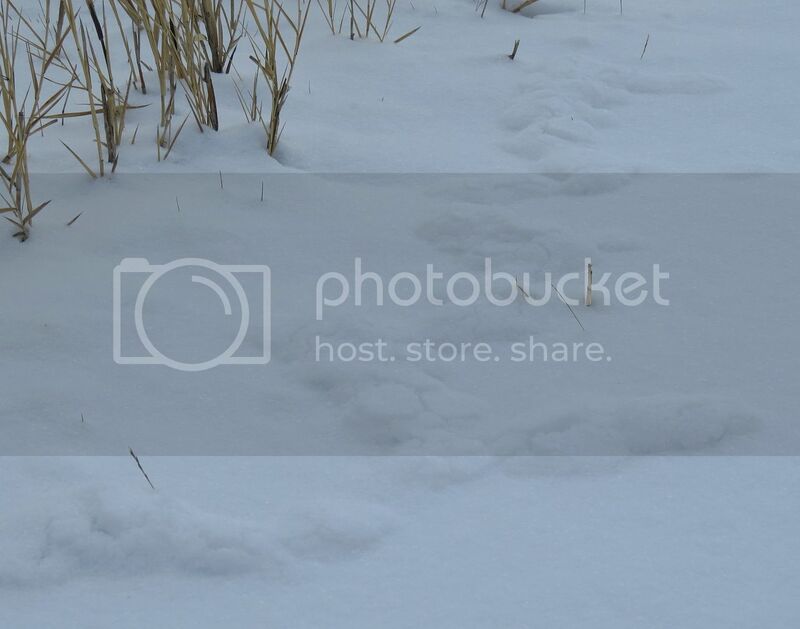 They overwinter under the snow as larvae and emerge to complete their growth and pupate in the late spring. 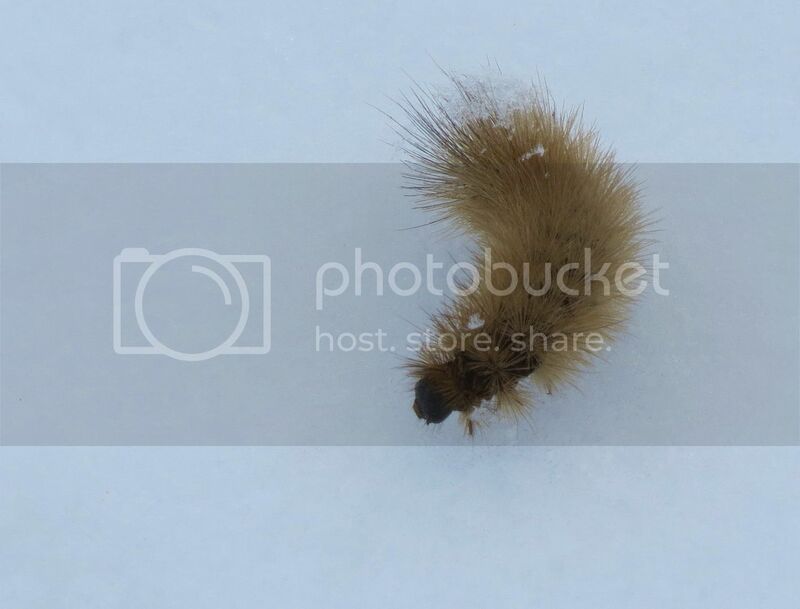 They have a recorded habit of coming out onto the snow as caterpillars and can withstand freezing temperatures via a combination of anti-freeze saturated blood (full of so-called “crypt-protectors”) and solar energy trapping body hairs and black skin color. I did not spot any Snowy Owls, and only found a loose feather of a Short-eared Owl, but was treated to the graceful moves a pair of Northern Harriers. 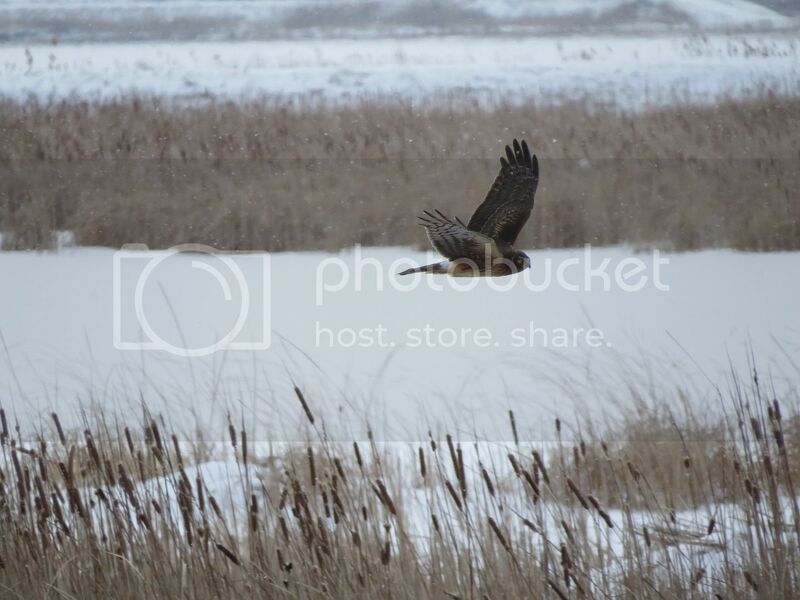 These birds perfectly represent the spirit of the winter marsh. These slender marsh hunters floated low over the cat-tails and canary grass hummocks searching for the sight and sound of mice and songbirds. Like ghosts they passed by on silent wings -riding the light breeze and rocking ever so slightly from its effect. 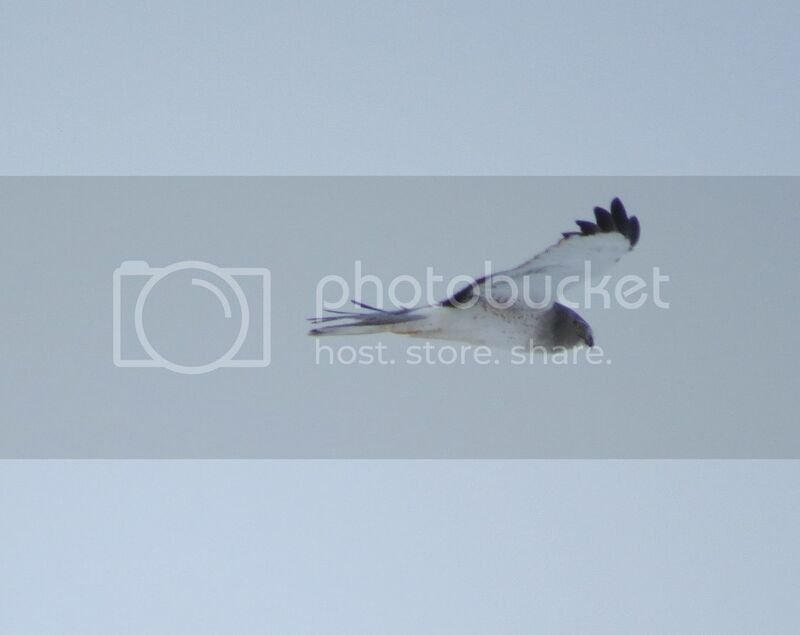 Both birds were marked with white rumps and held their long narrow wings with a species-defining crook at the wrist. The male was pale gray – nearly white – with stark black wing tips (above) and the female was dark rufous brown (below). I tracked them for as long as I could but they vanished into the frigid landscape well before they should have been out of sight. Like many of the marsh secrets they probably chose to remain aloof and somewhat mysterious. You may know, if you are one of the two people who actually read my blog, that I am a scientific name fanatic of sorts. I like them because 1.) you sound smarter than you actually are when you use them and 2.) they are quite fun and explanatory. 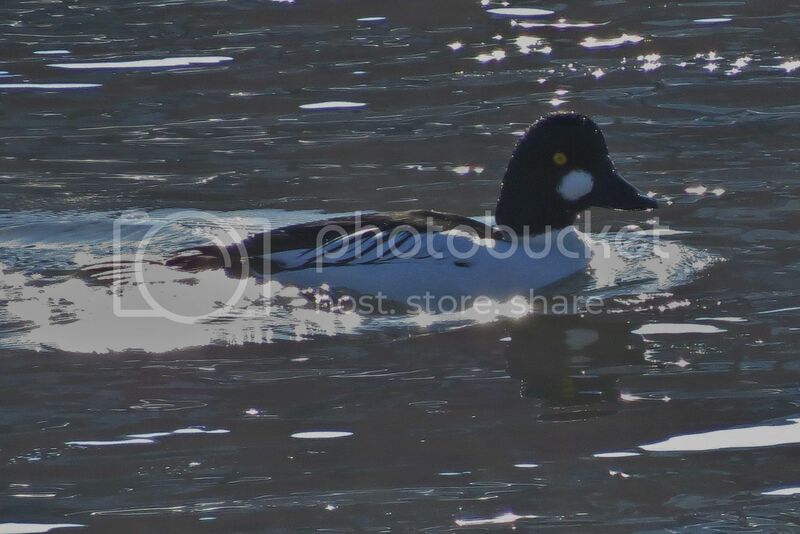 With that in mind I’d like to introduce you to Bucephala clangula – aka the Common Goldeneye Duck. We’ll get to the fun explanatory nature of that name in a moment. The frozen waters of the River Raisin open up along several stretches along its route. A short riffle section running through the downtown section, just ahead of the Monroe Street Bridge, serves as a major gathering area for the local waterfowl. On some days this gathering consists of what appears to be every Mallard in the western hemisphere but on others it holds a nice little selection of divers such as Redheads, Hooded Mergansers, Bluebills, and Goldeneyes. The diving ducks take advantage of the open water to bob under the surface for tasty crustaceans, aquatic insects, and pill clams picked out from the bottom gravel. This year, the Redheads and Goldeneyes are the dominant species. 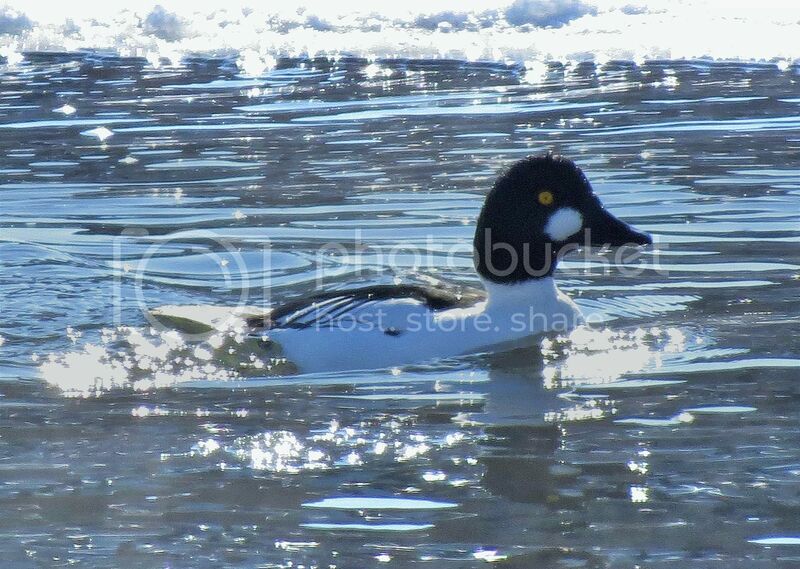 The Goldeneyes have attracted most of my recent attention because they are elusive flighty birds. They are hard to approach in the wild. Those occupied bucking the current and feeding on the River Raisin will put up with your presence long enough to allow for some quality observation time. 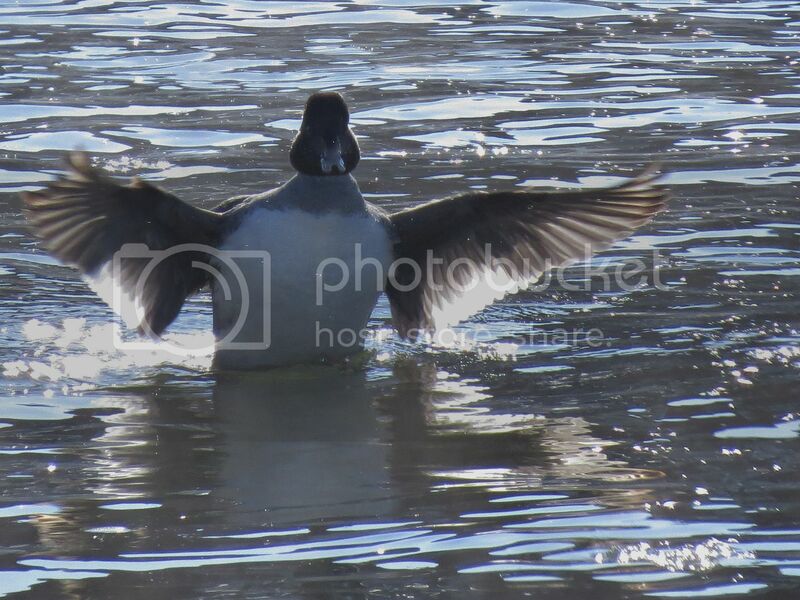 It is almost as if they are on a duck treadmill of sorts and they have to constantly swim in order to hover over a particularly productive spot in the river. Male Common Goldeneyes (I have to keep saying “common” because there is another species called the Barrow’s Goldeneye and I’d hate to confuse anyone more than I normally do) are distinctive in coloration. Actually they display very little true color, but are startling examples of contrasting pattern. The sides and belly are white, the back black, and the sides exhibit a pleasing zebra stripe design. The most obvious feature, however, is their enormous dark green head equipped with a bright yellow eye and a large white eye spot located betwixt the eye and bill. In other words, Bucephala, the “Ox Head” portion, refers to the Greecian way to say big headed. Alexander the Great had a beloved battle horse called Bucephalus so named because of its large head with large eyes. Goldeneyes have large heads. 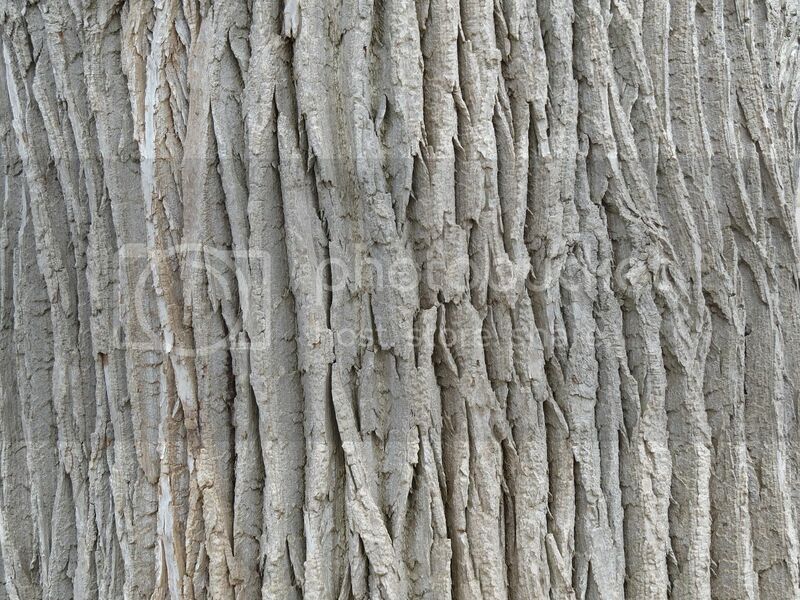 The species name “clangula” is a bit more problematical. This means “screaming” but could be interpreted as “to make an attention getting noise.” Goldeneyes do not scream, and are not loud by any stretch of the imagination, but they do whistle. In this context the name makes sense. 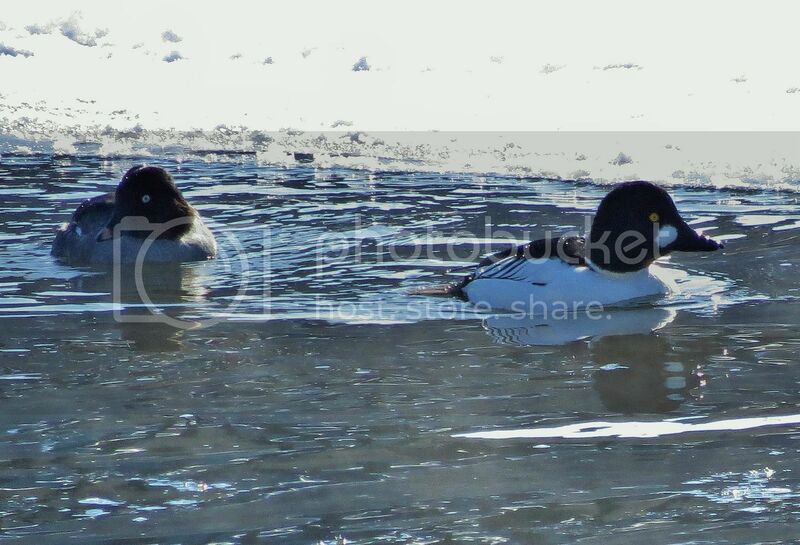 Common Goldeneyes are often referred to as Whistlers by duck hunters. Unlike Lauren Bacall these birds can’t put their lips together and blow, but instead create this noise with their wings as they fly. The rush of air through their rapidly beating primary feathers generates a pulsing whistle that can be heard from a great distance. This advance warning noise gives you just enough time to pull your thoughts together and declare “Look, there be a flock of Screaming Ox-heads approaching yonder.” On the water the birds limit themselves to quiet grunts and splashing dives and no such declaration should be made (especially if no one is in ear-shot). It would be wrong of me to end this account without acknowledging the females of the species. That would be Pig-headed of me. The hens have an attraction all their own. Their largish heads tend toward a cinnamon brown color and their eyes are hued with a duller shade of yellow (thus they do not look as continually surprised as the males). With mottled gray backs, white bellies, and yellow tipped bills the smaller females do not scream for visual attention. Yet are worthy of a portrait. You’d almost certainly have to call any such painting of a hen Goldeneye “Whistler’s Mother.” Well, at least I would. The winter temperatures have been hovering around the zero mark for the last few days. It’s been a mild season up to now so this first Arctic blast has seemed more brutal than usual. While we humans spent our time complaining about it, the animal world took it in mute stride. Of course, animals have no choice other than to deal with it. For active warm-blooded beasts, thermoregulation is the key. External warmth gained through cuddling or southern exposure enhances the ability to keep the body core temperature within safe limits. 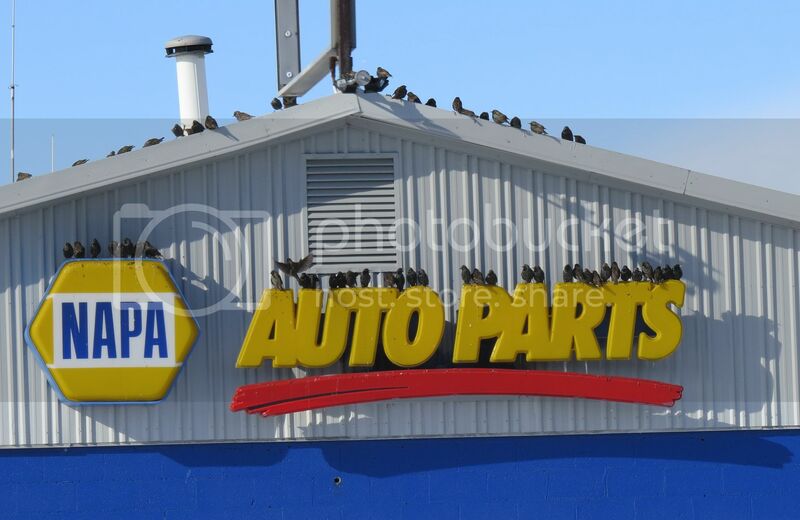 I had to admire the thermoregulatory antics of a gang of Starlings hanging around a NAPA auto store on a 4 degree (F) day. The birds were soaking up what they could of the morning sun and assembling along the south-east facing wall. The only good perch was provided by the large plastic “Auto Part” letters. True to their colonial nature, they were constantly shifting position to allow their fellow birds a place in the sun. Starlings do not have any self-spacing mechanisms so they happily crammed their puffy frames into minimal spaces allowed. The top of the “A” provided the least space while the con-joined “RTS” could accommodate up to a dozen fowl at a time. Taking a “P” took on a whole new meaning in this context. This location was soon rendered nil as the low angled sun crept westward and caused the eaves to cast a warmth-robbing shadow over the spot. For a few moments, however, these hardy little birds were using their collective wit to avoid freezing their A’s off!